In the 1890’s Glasgow, one of the most prosperous cities in the world, was a bustling hub of shipbuilding and trade. Victorian industry and engineering acumen brought world attention to its pre-industrial port. Goods and services thrived on the vast sums that flowed: Glasgow was well-primed for a concomitant cultural lift. At the time, Art Nouveau was sweeping over the European continent as the principal avant garde direction in design and architecture. Fortunately, in Glasgow at the right time and place were a group of Scottish artist/designers associated with the Glasgow School of Art. Known as the Glasgow Four, sisters Margaret and Frances Macdonald, graduates of GSA, talented painters and glass artists, married architect Charles Rennie Mackintosh and painter Herbert MacNair, respectively. The intimate Four soon dominated the Glasgow art world. Later their oeuvre was dubbed the ‘Glasgow Style’, a quieter but more lyrical form of “Art Nouveau’ architecture and design. 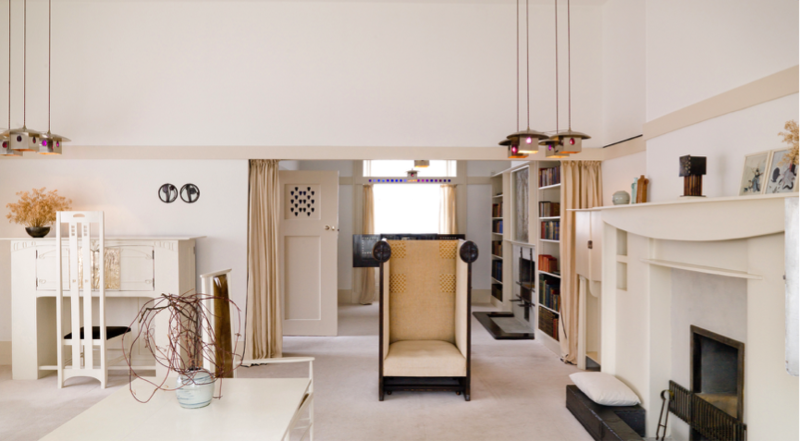 The Mackintoshes are arguably the only British designers whose work stands alongside their continental contemporaries in the extraordinary Vienna Secession. The 150th anniversary of Charles Rennie Mackintosh’s birth will be well-celebrated in Glasgow with, amongst other tributes, a major exhibition in Kelvingrove Art Gallery. What better time to re-examine his achievement, especially in the context of his partnership with his wife and the other members of the Glasgow Four? Why does only his name live on? Why was his brilliant career a mere ten years in length? To what extent was his imagination freed and his efforts supported by her brilliant artistry? With an aim of coming as close as possible to understanding the Mackintoshes as two of the most creative figures of the early 20c, we visit almost every one of their buildings – from the Glasgow School of Art to the Hill House in Helensburgh, and the Scotland Street School to Queen’s Cross Church. For points of comparison we will also study the proud buildings of the Victorian Merchant City, We take tea in their newly-refurbished Willow Tea Rooms and our lunch in the extraordinary House of An Art Lover.